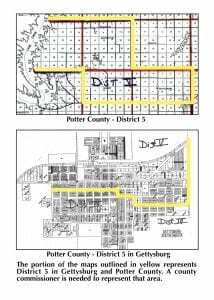 The Potter County commission is looking for a representative to serve on the board from District 5. District 5 is located in the central part of the county including some of Gettysburg, and covers area north of town and west to the river. Those interested and willing to serve on the board must reside within that district. The seat on the board was vacated when no candidates filed a petition for the position in the primary or general election. Until the end of last year, the district was served by commissioner Delvin Worth. The position will be filled at the March 5 meeting at the county courthouse. The county commissioners are Ken Iverson, Jesse Zweber, Sandy Hagny, and chairman Bill Frost. The maps at right show the rough boundaries of the district.